Joseph Shaw, a member of the Aurorasaurus Scientist Network, photographed this aurora over Poker Flat Research Range near Fairbanks, Alaska, in March 2011. Auroras are beautiful displays of dancing, colored lights in the sky. Few people live far enough north or south to see auroras often, but the celestial show draws travelers from around the world and remains a popular bucket list item. The year 2015 was good for fulfilling those dreams, as widespread auroras glowed on St. Patrick’s Day in March and again near the summer solstice in June. When auroras lit up the skies in spring 2015, citizen scientists around the world sprang into action. When auroras lit up the skies in spring 2015, citizen scientists around the world sprang into action, sharing reports about the colors and height of the auroras they witnessed and helping to verify data collected from others. This collaboration was made possible by the National Science Foundation–funded Aurorasaurus community, which serves as a centralized hub where citizen scientists can gather and share aurora data on the project’s website and mobile apps [MacDonald et al., 2015]. Why Do We Need Auroral Research? Auroras occur in Earth’s upper atmosphere, usually 100–200 kilometers above the surface. They fall into the category of “space weather” because they are the direct result of geomagnetic storms. These storms occur when the solar wind—a stream of charged particles and magnetic fields coming from the Sun—disturbs Earth’s magnetic field. Geomagnetic storms have the potential to severely disrupt society and technology: interfering with signals to and from the Global Positioning System (GPS), for example. Under some conditions, ground- and space-based electrical systems can be damaged by the same high-energy particles responsible for auroras [National Research Council, 2008]. Currently, relatively few instruments monitor for geomagnetic storms. Currently, relatively few instruments monitor for geomagnetic storms. These storms tend to develop 2–3 days after bursts of activity on the Sun, but the best measurements of their strength happen roughly 1 hour before they collide with Earth’s magnetosphere. Models suggest what regions will likely see auroral activity, but geomagnetic storms can be unpredictable and change rapidly. Aurorasaurus aims to put more eyes on the sky to create a real-time map of auroral visibility. Then, existing visibility models can be compared with actual ground observations from citizen scientists, providing data for model improvements and giving scientists a better understanding of auroras. 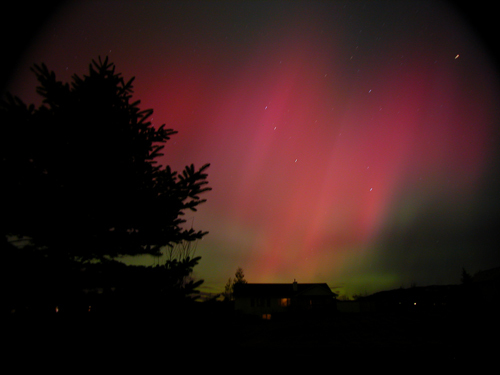 Aurora over Bozeman, Mont., photographed by Joseph Shaw, a member of the Aurorasaurus Scientist Network, in November 2004. Aurorasaurus collects auroral observations for the real-time visibility map using two different methods. First, observers file observation reports on the Aurorasaurus.org website and from the mobile app, and software plots the report’s position on a map on the basis of the observer’s location. These reports allow users to attach images and share details about what they witnessed. Images are important because the appearance of an aurora may change dramatically with time or vantage point. Users share their approximate location, time, and observed colors, as well as the aurora’s height in the sky. Users can indicate whether they are seeing discrete arcs (distinct lines or curves) or a diffuse glow (widespread, no distinct shape) or pulsating patches. 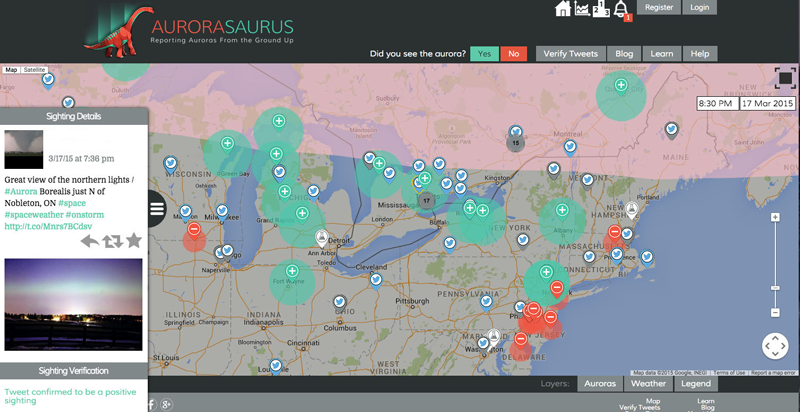 The second type of data collected and displayed on the map comes from Twitter users, many of whom may never have heard of Aurorasaurus. In recent years, an upswing in tweets referencing the words aurora, northern lights, and southern lights has coincided in time with widespread auroral activity [Case et al., 2015a]. Many people like to share the news of their auroral sightings with friends. Aurorasaurus captures tweets with these keywords, filters them, and places them on the visibility map, making it possible to be a citizen scientist without even knowing it. When Will the Next Big Aurora Occur? Technically, auroras are always happening because the solar wind is always blowing charged particles from the Sun toward Earth, but most of the time, they are much too faint to be detected. When they can be seen, they are usually in remote areas with few people. When bright auroras are predicted, Aurorasaurus spreads the word. The project offers a location-based notification system to alert users that auroras might be visible based on nearby observations and tweets. At any time, Aurorasaurus users can check the solar wind power plot, which shows data for the most recent 36-hour period. This plot is a good general indicator of upcoming auroral activity. Aurorasaurus relies heavily on user input, so the project aims to build a community of educated and enthusiastic contributors. Aurorasaurus relies heavily on user input, so the project aims to build a community of educated and enthusiastic contributors. This goal is somewhat challenging for a project that cannot predict when it will need to call its volunteers to action. Fortunately, the majority of Aurorasaurus users (55%) self-identify as aurora enthusiasts, and 30% participate in other online aurora communities. These users are the lifeblood of the project. During times when auroras are infrequent, users are encouraged to learn about the science behind auroras and take quizzes to test their knowledge. In-depth infographics are available to address how layers of color form. Users share news and address questions from other users on a blog. Users also have opportunities to interact with space weather scientists who volunteer through the Aurorasaurus Scientist Network. These group members share their experiences as auroral researchers through the blog and during live Tweet Chat and Google Hangout events aimed at helping the public understand auroras and appreciate space weather research. Aurorasaurus data are even used in some classrooms. Educators participating in a NASA Heliophysics project have students compare local magnetometer data with the real-time solar wind power data on Aurorasaurus.org. Aurorasaurus users have another important role: verifying “positive tweets” about the aurora that represent unique, positive, real-time sightings. To be classified as a positive tweet, it must be sent by the person making the observation: “I just saw the aurora.” On the other hand, “My Aunt Millie in Montana just saw the aurora” would be marked negatively because the tweeter and Aunt Millie might actually be very far apart. “I hope I get to see the aurora tonight” would not count as a positive observation, nor would a retweet of an aurora image, where tweeters around the world pass along an interesting tweet to their networks of followers. Spam filters remove references to the city, business, and princess that share the name Aurora. True references to the celestial phenomenon (meaning real-time tweets that are relevant and resolved into the correct location) must still be assessed by humans. Most Aurorasaurus data collected thus far originated from the March and June 2015 geomagnetic storms. Around St. Patrick’s Day, Aurorasaurus users filed 170 observation reports (Figure 1), many of which included photos [Case et al., 2015b]. Hundreds of tweets were captured; users verified 420 of them as unique, positive, real-time sightings of auroras. Interestingly, many of the observations occurred quite far south of the predicted viewing region, indicating that models could be improved with these new data points [Case et al., 2016]. Fig. 1. Users reported widespread aurora sightings in real time on 17 March 2015 on Aurorasaurus.org. Many sightings occurred south of the auroral oval, the pink region on the map, where the aurora is predicted to be visible overhead. Legend: auroral reports from citizen scientists, green; tweets positively verified as auroral sightings, blue with bird; tweets not verified or not a sighting, gray with bird; and locations where citizen scientists did not see the aurora, red. Recently, Aurorasaurus rolled out a map with the new Oval Variation, Assessment, Tracking, Intensity, and Online Nowcasting (OVATION) prime model for the auroral oval, as well as an estimated “view” line. Aurorasaurus will continue to tweak its algorithms to provide better forecasts and tools. Using Aurorasaurus, scientists and citizen scientists will continue tackling the challenges of predicting space weather. When the next storm strikes, Aurorasaurus users will spring into action, ready to share their observations of this beautifully intriguing phenomenon. This material is based upon work supported, in part, by the National Science Foundation (NSF) under grant 1344296. Satellite-based space weather data and models used by Aurorasaurus are provided by the NOAA Space Weather Prediction Center. Any opinions, findings, and conclusions or recommendations are those of the author(s) and do not necessarily reflect the view of NSF. Case, N. A., E. A. MacDonald, M. Heavner, A. H. Tapia, and N. Lalone (2015a), Mapping auroral activity with Twitter, Geophys. Res. Lett., 42, 3668–3676, doi:10.1002/2015GL063709. Case, N. A., E. A. MacDonald, and K. G. Patel (2015b), Aurorasaurus and the St. Patrick’s Day storm, Astron. Geophys., 56(3), 3.13–3.14, doi:10.1093/astrogeo/atv089. Case, N. A., E. A. MacDonald, and R. Viereck (2016), Using citizen science reports to define the equatorial extent of auroral visibility, Space Weather, 14, doi:10.1002/2015SW001320. MacDonald, E. A., N. A. Case, J. H. Clayton, M. K. Hall, M. Heavner, N. Lalone, K. G. Patel, and A. Tapia (2015), Aurorasaurus: A citizen science platform for viewing and reporting the aurora, Space Weather, 13, 548–559, doi:10.1002/2015SW001214. National Research Council (2008), Severe Space Weather Events—Understanding Societal and Economic Impacts: A Workshop Report, Natl. Acad. Press, Washington, D. C.
Citation: Clayton, J., and M. Hall (2016), Aurorasaurus puts thousands more eyes on the sky, Eos, 97, doi:10.1029/2016EO050439. Published on 18 April 2016.